I have an older computer that has virtualization in the BIOS, but is too slow to run a VM. What I did was take the ISO file out of the VM and burn it to a CD-RW. Any time the outernet firmware changes, I can re-burn the CD, boot it up (booting from the CD drive), and flash the Chip with no problems whatsoever! It always works the first time. Be sure to burn the CD-RW on the slowest speed just in case. Ha! I never would have thought about that workaround. I don’t even own a CD/DVD writer any more. Great to see that this is an option, though. Thanks @neil: yes, i noticed some file sync problems with Alphasat over the weekend. Am looking into it. My receiver appears to have stopped worked sometime around mid-day yesterday. A reboot this morning got it up and running again. Are any files created upon a failure that would be helpful to pass on? the system messages file should have messages from before reboot. just start scrolling from bottom and see if theres anything in there right before the last set of startup messages. Please post if theres anything out of the ordinary there. that said, my experience is that any uptime-failures are, 9 times out of 10, power supply problems. 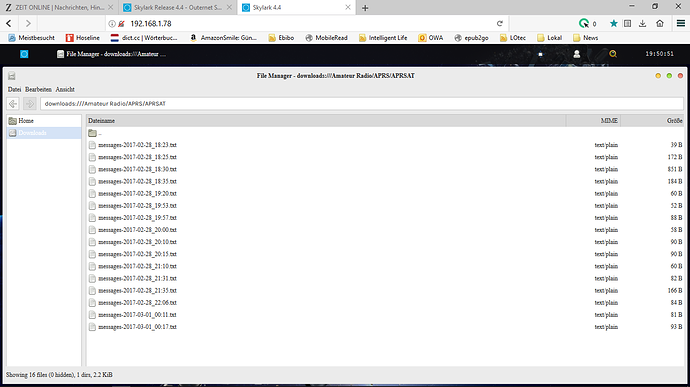 Alphasat - I am looking for assistance in tracking down file delivery issues on the Alphasat beam. Can people on Alphasat please post their /var/log/messages (“System Messages” from Log Viewer) here or in a PM to me? Specifically - are you successfully receiving APRS message feeds? Please check in “What’s New” - when was the last time you received messages? Could you include a screenshot of File Manager open to “downloads:///Amateur Radio/APRS/APRSAT” and scrolled to the bottom, along with the UTC time when you took it? Looks like a carousel scheduling problem. Whats your SNR like - approximate range? From your data point, and other receivers I am monitoring, the larger files seem to get thru fine, but the smaller ones are not being delivered. a nearby dish (still have to move the antenna). I just did that and the signal is the same as always. I see no recent files in /mnt/download/.cache so it does not appear to be a packet loss problem. I have received 1067193 packets with 40 errors. My receiver is on 44.137.41.102 and should be reporting to your server. No, I am not receiving APRS Messages. Setup was fresh from yesterday. That sounds like a power supply problem. As you can see in the log your chip powered off during a cleanup, when its under additional load. Try a different power supply. @wsombeck, @pe1chl: are the file deliveries better now? as of the last ~2 hours? Could you check and report? Hi Abhishek, it works now: obereip.selfhost.de. Can you send the contents that OTA formatted for 4.4? Hopefully it will help!